Daniel is a unique mix. While it begins with history, it makes a strong transition in chapter 7 where it contains visions of future events. Read more about the book of Daniel. It is doubtful that any Old Testament prophet played a more significant role in the history of Israel than Daniel. Taken from his homeland while still a teenager (he was no more than 15) and pushed through a highly competitive crash course in a foreign culture, Daniel emerged as the premier prophet during the reigns of several monarchs of the captivity era. 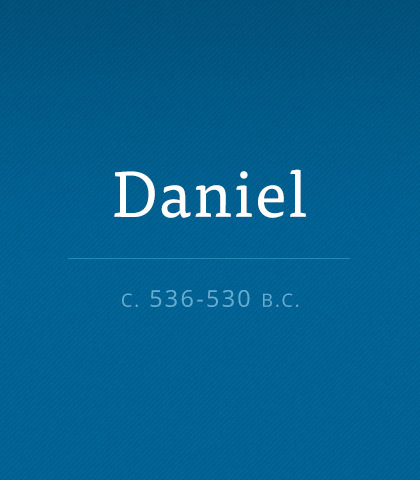 The prophet Daniel is unquestionably one of the most remarkable men not only in the Bible but also in all of Jewish history. The book that bears his name traces his life from his teenage years through his days past the age of 80. For 70 years, Daniel lived in captivity (605-536 BC) while serving in the metropolitan capital city of Babylon as prime minister. But when the Jews returned to the Promised Land, Daniel's life, work, and ministry drew to an end. Nebuchadnezzar may have been anxious to know the interpretation of his dream, but he probably winced when Daniel told him that Babylon would not endure for eternity. How did Daniel know? The Lord revealed to him the king's dream of a great statue made of precious metals and clay and of a rock that destroyed the statue and grew into a mountain. This was God's blueprint for the future—a blueprint encompassing the whole world, beginning with Babylon. Startled from his sleep by a nightmarish dream, King Nebuchadnezzar called his magicians, conjurers, and sorcerers together and put them to a test. Would they be able to relate the dream and give its interpretation? Each of these learned men failed. In a fit of rage, the king ordered the death of all the wise men of Babylon—even those who had not been asked about the dream, such as Daniel and his three friends. But with wisdom, Daniel asked for time and God gave the answer. Why is it the righteous are made to suffer? When we have been obedient to God, why do we often have to endure fiery ordeals? Where is God during these times? And what of His fairness and justice? These are natural questions for those who suffer unjustly. Daniel's three friends—Shadrach, Meshach, and Abednego—could have asked similar questions. They literally went through a fiery trial, but they discovered that God was in their midst. And this truth is a comfort when the suffering and questions come. Daniel chapter 4 is one of the most unusual chapters in the Bible. King Nebuchadnezzar had another dream. But this one proved to be his undoing and then his renewing. Prideful as a man, he became insane and lived like a beast until he humbled himself and praised God with some of the most eloquent words ever to fall from human lips.